Sell to Us Price: $820.81 each. Many investors buy gold 20 gram bars as part of a diverse investment portfolio. 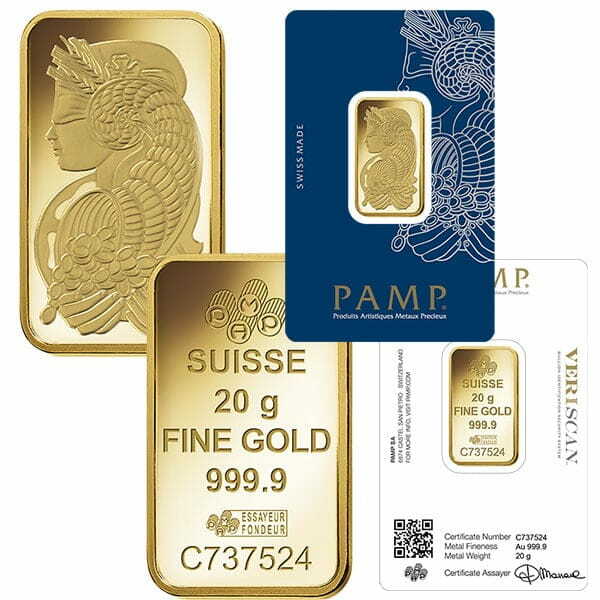 Two of the most respected mints in the world are Australia's Perth Mint and Switzerland's PAMP Suisse. While they are many miles apart, both produce high-quality gold bars for investment purposes. 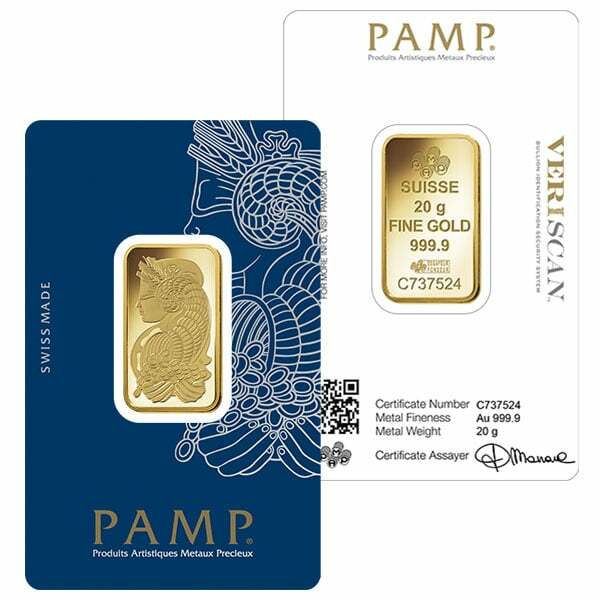 Discover why 20 gram gold bars are reputable and highly trusted in the precious metals community. Precious metals such as silver, copper, platinum, and gold come in various forms. The most common ones are rounds, coins, and bars. Investors can buy gold certificates and notes, which are claims on gold held by the owner. Another riskier proxy for gold ownership is holding shares of precious metals ETFs. Physical gold can also be held inside a precious metals IRA. A gold bar can be referred to as a gold ingot or gold bullion bar. A producer makes gold bars from refined metallic gold. They are manufactured and labeled with their weight and purity according to specific standards for investment purposes. Gold ingots are one form of gold bars. The molten metal is poured into molds known as ingots. 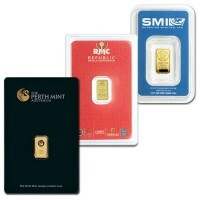 Smaller bars can be made from stamping or minting rolled gold sheets. Large gold bars are held as gold reserves by central banks and wealthy investors. Gold bars are produced at a refinery or mint. They are measured in troy ounces. The 400-troy ounce bar is the standard unit which is commonly traded among bullion dealers in the West. These gold bars are 438.9 ovidparous (or standard) ounces. 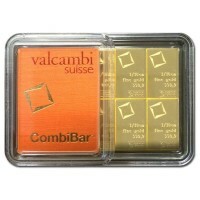 The most manageable large gold bar for trading and investment is the kilobar which is the most common size in the East. A kilo weighs 32.15 troy ounces, which is equivalent 1000 grams. It is ideal for the smaller transfers made between banks and traders. While most of these kilobars are flat, some come in a brick shape. The largest gold bar in the world weighs a whopping 551 pounds. This incredible gold bar is located at the Toi Gold Museum. This huge gold bar was manufactured by Mitsubishi Material Corporation. It was first displayed at the museum in 2005. 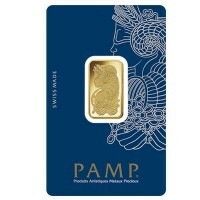 Clearly, the 20 gram gold bar is much more accessible to individual buyers! 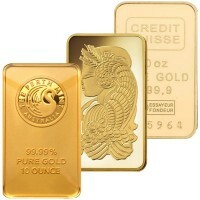 Compared to the large bars traded between banks and traders, the 20 gram gold bar is much lighter. It only weighs 0.705479 standard ounces, which equals 0.643015 troy ounce. 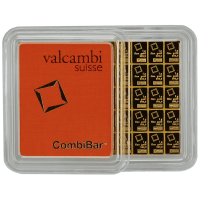 The compact size makes a 20 gram gold bar easy to hold or give as a gift to employees, graduates, and others. Besides weight, the purity of the gold is another factor to consider when making an investment in precious metals. The minimum purity required by bullion exchanges is 99.5 percent gold. 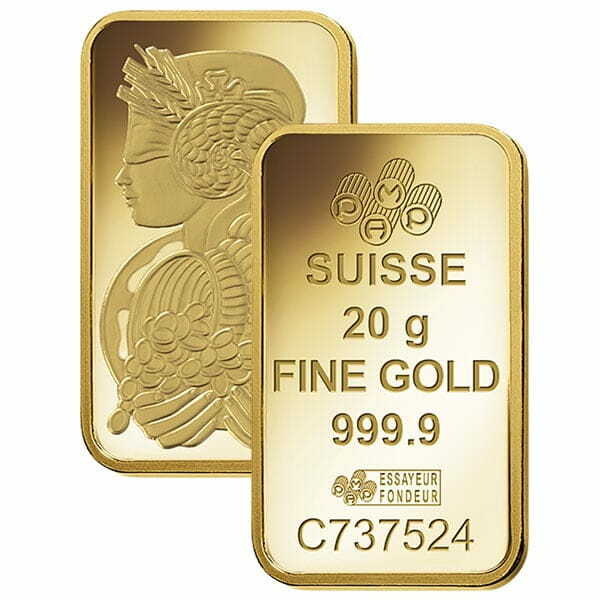 However, most of the 20 gram bars manufactured for investors are .9999 pure gold. This level of purity is referred to as fine gold. An analysis called an assay is conducted to measure the composition in precious metals. This ensures the bars produced in a mint meet the proper standards of purity and weight. Consider the difference in value between plated gold items and ones made from 18 karat gold. Purity is a crucial factor in ensuring liquidity and desirability. The price of a 20 gram gold bar varies based on the current global spot market. American investors and buyers around the world are always watching the prices based on their own currency. Some open the daily paper to check the current rates while others read popular dealer reviews and updates online at websites like MoneyMetals.com. The goal of any investor is to buy the most and/or purest gold for the lowest competitive price. Investors also recognize the price of precious metals will rise and fall in unpredictable cycles. Investing is not for the fainthearted. However, savvy investors recognize purchasing precious metals is a way to try to preserve wealth for the future. The value of local currency may plummet but precious metals can have value worldwide. Smart buyers choose to work with a company such as Money Metals Exchange. We offer informational updates and a lot of precious metals products online. Purchases can be made at our secure website. You can even use a credit card. Once the 20 gram bars are sold to you, shipping is provided to the destination of your choice. The process is a simple way to try to add value to your investment portfolio. Are you interested in larger bar sizes? Consider buying 10 ounces of gold for your next investment purchase. Or if you're interested in also adding gold coins to your investment, you can look at the options of gold coins we have here. You can go with the our popular American Eagle gold coins, or check out other World Mint coins, such as the Canadian Maple, which can add a bit of history to your collections. Or we have gold coins from other world mints, so you can have gold coins from all over the world. Our current buy pricing is $820.81 each and we will buy up to 10 ounces at this price. Simply call us on any weekday to lock pricing at 1-800-800-1865. 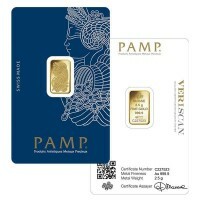 You can now sell your PAMP Suisse 20 Gram Gold Bar back to us online, at a price of $820.81 each!